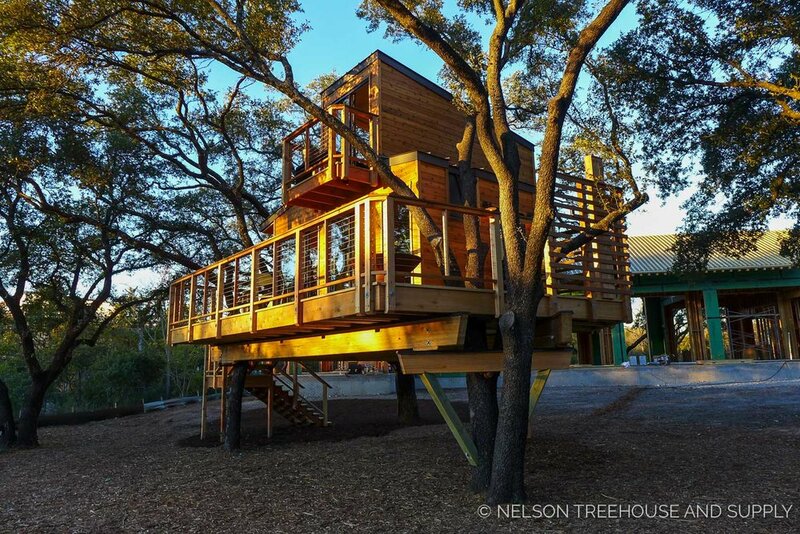 Building this treehouse for KC and his family in Texas was such a fun creative challenge! 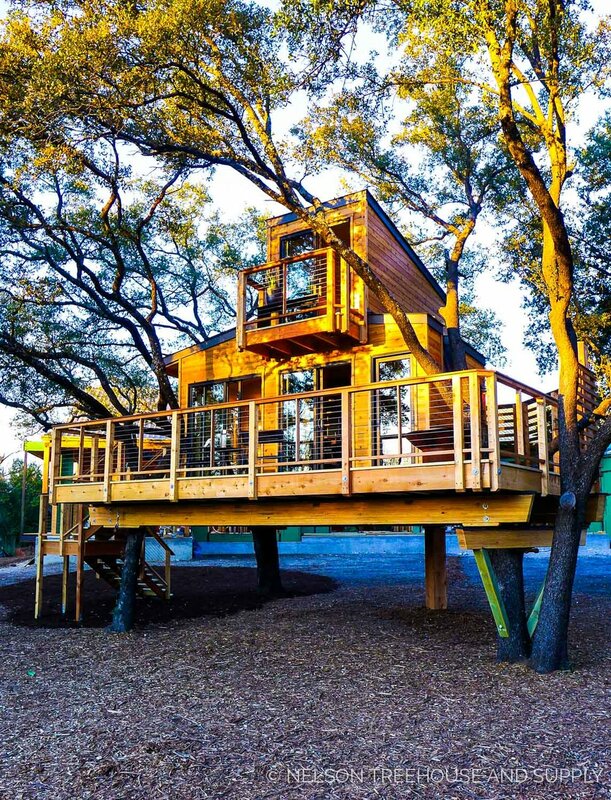 Pete and the crew integrated contemporary architectural design with a grove of live oak trees for a sleek and chic treehouse retreat. 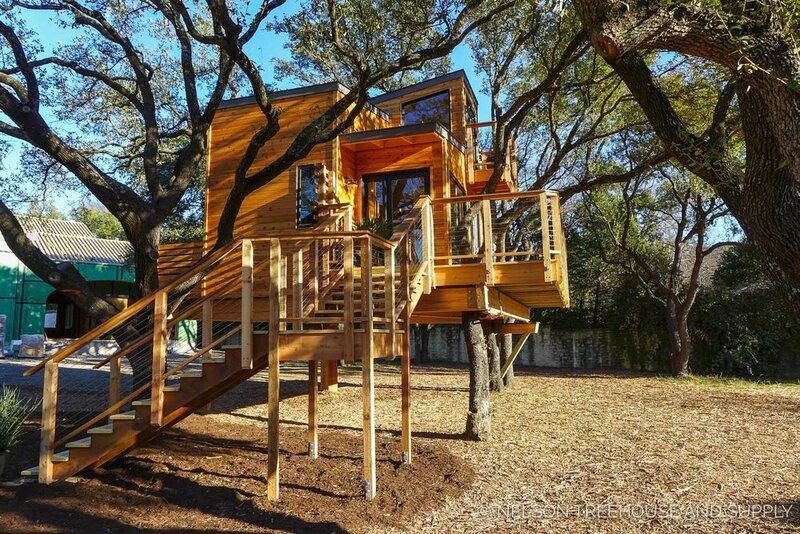 Nestled eight feet high in live oak trees, this treehouse blends contemporary design with classic treehouse materials. Geometric forms, single pitch roofs, and large glass windows speak to a modern aesthetic, while wood paneling gives a warm and welcoming touch. The staircase has a gentle rise (6/12). The overhang above the front door is one of the few extended rooflines on the structure - the boxy forms, lack of overhangs, and absence of gabled rooflines resonate with the modern aesthetic. On the deck, trellis walls weave around oak branches and shield the outdoor shower. The inside holds a master bedroom, bathroom, kitchenette, lounge, ship’s ladder, and loft. The crew created many custom built-ins, including this sliding bedroom door, made of steel and live-edged walnut. 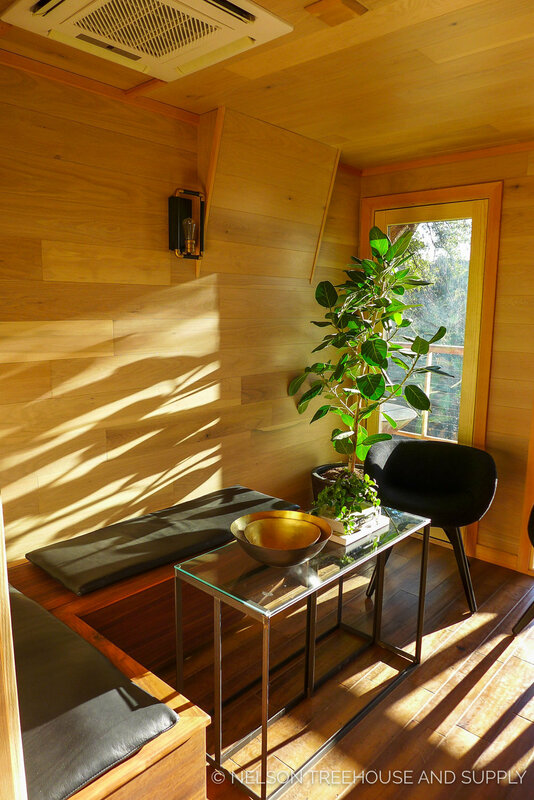 This built-in corner seating keeps the space open and streamlined. A ship's ladder leads to the loft. Walnut slabs also add interest to the bathroom vanity and corner nook in the bedroom. The interior paneling is made of TerraMai white oak wood. The loft upstairs provides plenty of space for kids to play. A sliding glass door leads to the upstairs balcony - that vantage point provides sweeping views of a nearby creek! 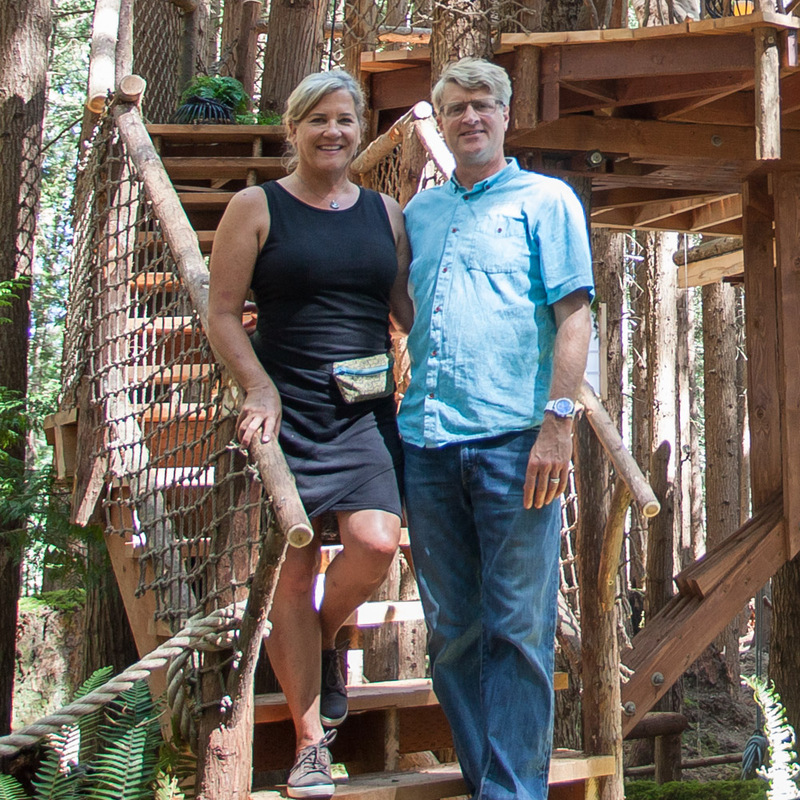 The deck railing is made of western red cedar posts and stainless steel cabling. Western red cedar siding glows golden in the setting sun. 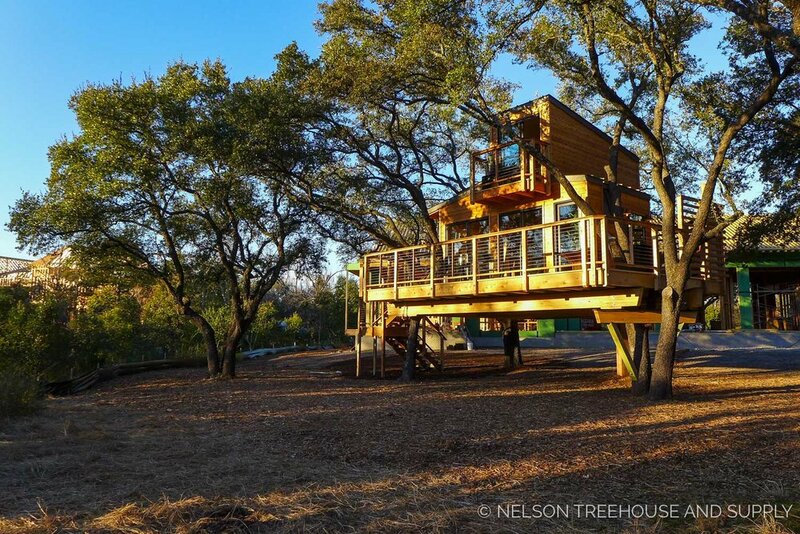 The crew worked closely with the landscaping on the property, ensuring that the treehouse would flow with the rest of the site. 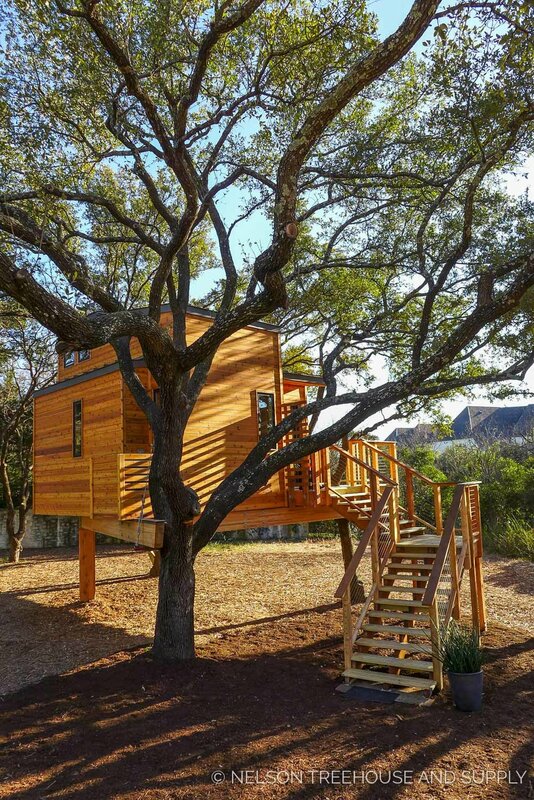 We hope you've enjoyed taking a closer look at this sleek, contemporary treehouse! Thank you, KC, for a wonderful build!